I'm Brandy Thomason McNair, I create artisan jewelry with an eye for design and a love of all things natural and vintage. Bella Vita is about appreciating style and craft. It lets me work with my hands, curate/blend objects & elements, and create ways for people to express their natural style. Essential Oil + Gemstone Bracelet Sets are sold individually or as a package deal. Each bracelet set includes one Lava Bead bracelet and one Natural Stone bracelet, each with a coordinating accent bead. Natural stones include: Dalmatian Jasper, Pyrite, Amethyst, Desert Jasper, Crazy Lace Agate, Sodalite, Peach Moonstone, River Fossil, Grey Agate and Obsidian. Bracelet card packaging features metaphysical properties of each natural stone and instructions on how to apply essential oils to the porous lava beads. The package deal includes 2 of each bracelet set. Kraft paper box included with each bracelet set upon request, or a handmade oak display block can be purchased to display the carded bracelet sets. Available in 10 different combinations. Bracelet card included with every set. The Zara Stone Drop Necklace is a Bella Vita best seller. 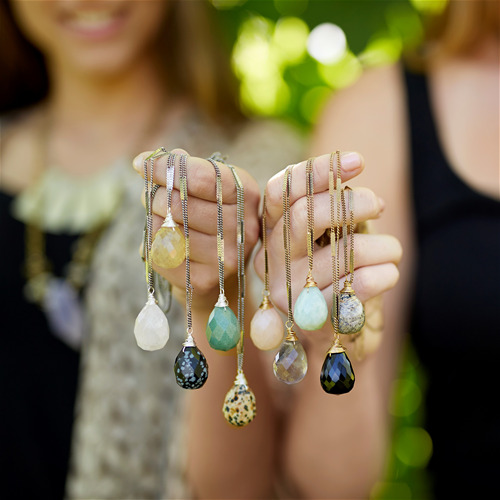 Each natural stone drop is approximately 1" long x 1/2" wide and hangs from a 30" long antique gold or antique silver plated chain. Currently available in 21 color ways, with a new Spring Palette debuting at NY Now. Hand Stamped Cuff Bracelets are available in Brass or Sterling Silver. Choose from 3 fonts and any of our most popular mantras, or create your own mantra! Also available with GPS coordinates. Fonts - large block (appx 4 millimeters tall), small block (appx 2 millimeters tall) or typewriter (appx 2 millimeters tall). 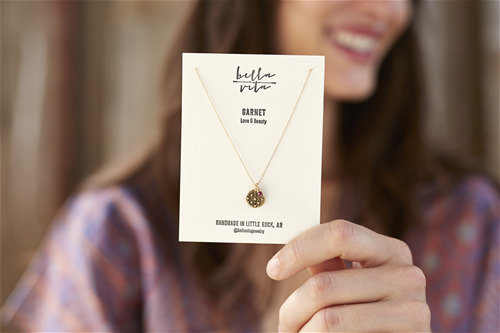 In Bella Vita's original necklace line called "In the Garden", designer Brandy McNair has turned her eye toward the past, to days when she and her grandmother spent countless happy hours tending her garden. Available in 8 different garden-themed pendant designs, made from molds of antique buttons Brandy collected from her grandmother's collection. Choose from two metal options: pewter pendant on silver plated chain, or gold plated pewter pendant on gold plated chain. Watercolor necklace card designed by May We Fly included with every necklace. Metal Options: Pewter pendant on silver plated chain, or gold plated pewter pendant on gold plated chain. Chain Length - 18” with 2" extender. Pendant is approximately 3/4” in diameter. 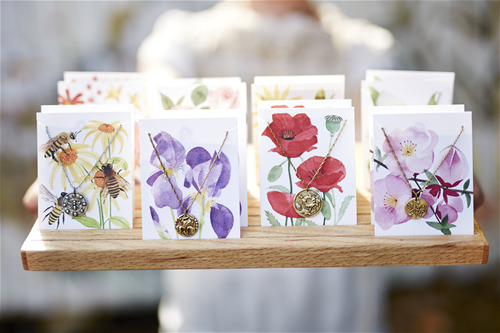 Watercolor necklace card designed by May We Fly included with every necklace. 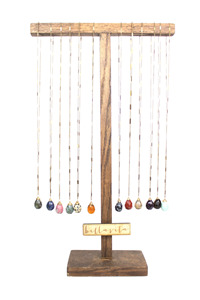 A portion of sales from these necklaces will go towards planting wildflowers. along the state highways in Arkansas, our home state. Handcrafted in Little Rock Arkansas. Each necklace in the Birthstone Collection features a pendant cast from the mold of an antique button, paired with one of 12 birthstones. Necklace card packaging includes metaphysical properties of each natural stone, but does not list the birthstone month, so it can be bought specifically for the birthstone or because of the properties it represents. Choose from two metal options: Pewter pendant on fine silver chain, or gold plated pewter pendant on 14K gold filled chain. Letterpress necklace card designed by Yella Dog Press included with every necklace. 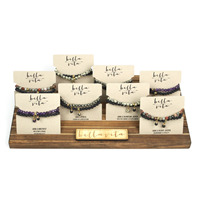 Bella Vita Mantra Bracelets are some of our top sellers! 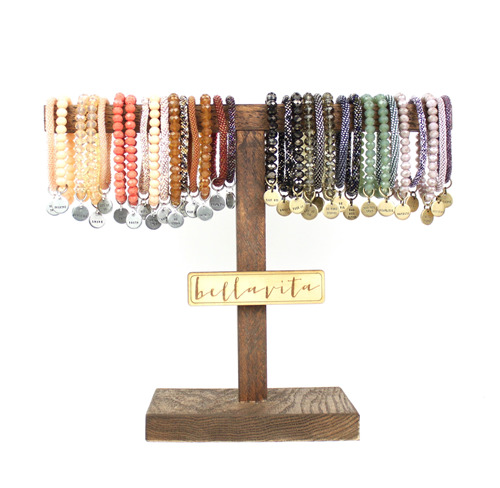 Our Mantra Bracelet Bar features 32 bracelets in the color palette of your choice (16 crocheted beaded bangles & 16 crystal bracelets). 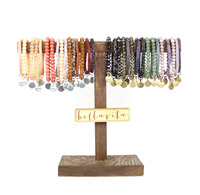 Select 8 different hand stamped mantras in gold plated, antique pewter, or a mixed metal combo. We also sell the handmade wood display.